An amphibious vehicle called the 'Ride the Ducks' attraction capsized on a lake in Missouri Thursday later afternoon. Unfortunately, 11 of the 31 passengers died whilst 5 others are still missing. Some of the deceased are children. 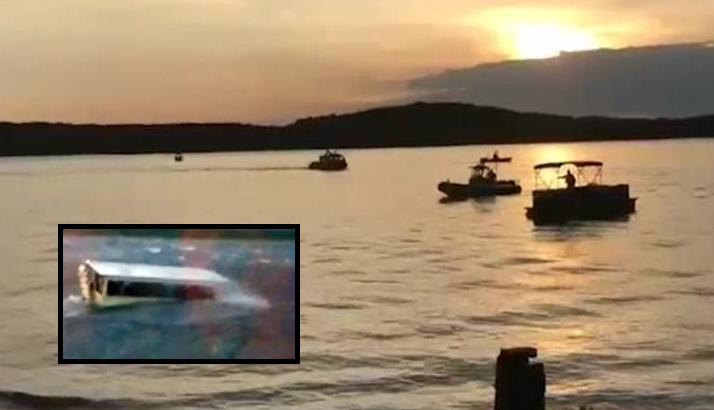 The shocking footage which was recorded at the scene at Table Rock Lake, Stone County, just outside of Branson, Missouri, shows the moment the 'Ride the Ducks' amphibious vehicle is being lashed by giant waves before it is tilted to the side and starts to sink slowly into the lake. Just before the raw footage video is cut out, you can see that the boat is about to be submerged up to the windows. Mr Jeff Carr, who was on the same lake as the incident unfolded nearby, explained: "The waves were 6 feet tall, for a lake that's pretty big." His wife, Jennie, admitted: "The wind was crazy, trying to blow the boat back around. I've never seen waves like that on a lake." Ripley Entertainment, the company operating the duck boats, said via its spokesman Ms Susan Smagalla that they would be assisting authorities best they could and that this was the first accident in more than 40 years of operation: “We are deeply saddened by the tragic accident that occurred this evening. This incident has deeply affected all of us. We will continue to do all we can to assist the families who were involved and the authorities as they continue with the search and rescue." "The safety of our guests and employees is our number one priority." [email protected] telling Steve Dellar (a British homosexual) to focus on stories from within the United States. 31791 and how'd ya know? Spill the beans!! !